Ibex - any of several surefooted, sturdy wild goats of the genus Capra, family Bovidae (order Artiodactyla), found in the mountains of Europe, Asia, and northeastern Africa. 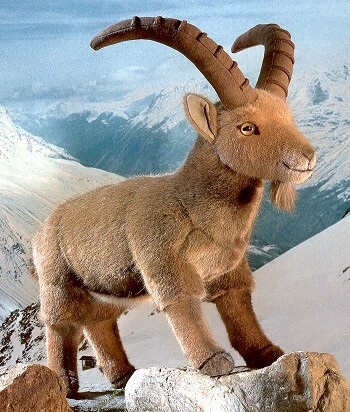 The European, or Alpine, ibex (C. ibex ibex) is typical. It stands about 90 cm (3 feet) at the shoulder and has brownish gray fur, darker on the underparts. The male has a beard and large, semicircular horns with broad, transversely ridged front surfaces. The European ibex inhabits the line of perpetual snow and lives in herds, except for the old males, which are usually solitary. Formerly common throughout the higher ranges of the Alps, this ibex is now greatly reduced in numbers. It is protected locally in the Italian Alps and has been reintroduced elsewhere.